Life is what you make of it, so why not make it the very best? 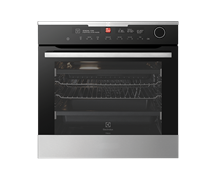 The new Electrolux FullTaste Steam Oven pairs the best in cooking technology with a sleek and stylish design. This state-of-the-art oven provides a cooking experience that's as luxurious as it is functional - perfect for entertaining and making gourmet everyday. Hear from Brand Ambassador and Chef Massimo Mele on how he loves to use his FullTaste Steam Oven with Smart Food Probe. Our FullTaste Steam Ovens lock in the most delicate of flavours to ensure restaurant quality cuisine every day of the week. Discover our delicious apple, salted caramel cookies recipe using steam. Never overcook a roast again. Just set the oven to your desired temperature and let the Smart Food Probe do the work. It conveniently measures the core temperature of food and switches off the oven when its ready. Now that's luxury. An oven that cleans itself? Luxury at its finest. Pyrolytic cleaning removes the need for you to use harsh chemicals to clean your oven. Simply set the Pyrolytic function, come back when it is complete and wipe away the residue. 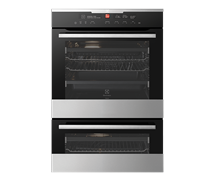 Lock in the flavours and achieve the perfect roast with our FullTaste Steam oven. Discover our delicious herb crusted lamb with salsa verde recipe using steam.